Trawling bans and quota reductions being proposed by regulators will result in bait shortages that will cause prices to skyrocket, the lobstermen say. Regulators are taking drastic steps to avert a collapse of the herring fishery, adopting trawling bans and proposing rock-bottom quotas. While environmental groups and those who fish species that rely on herring for food, like striped bass and tuna, cheered the action, the Maine lobster industry was left wondering how it will survive without its favorite bait. Patrice McCarron, the executive director of the Maine Lobstermen Association, predicted it will force some lobstermen off the water. 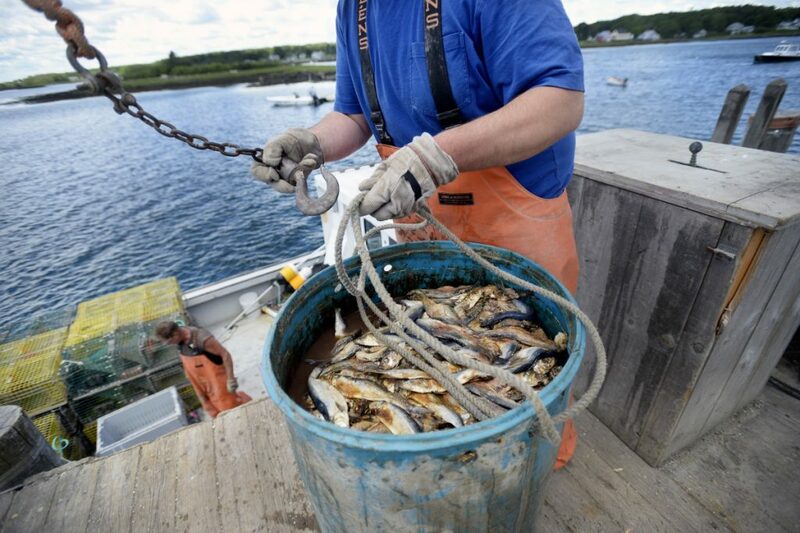 About 70 percent of all herring landed in the U.S. ends up as bait, mostly for the lobster industry. In the last five years, as lobster hauls increased, the demand for herring went up, too, just as herring landings began to fall, McCarron said. That has driven up the bait price. In 2013, Maine lobstermen were paying $30 a bushel. Now, a bushel costs $45 on the coast, or $60 on the islands. McCarron expects the price of bait to double next year, which would be a disaster for Maine lobstermen, she said. Her organization has been meeting with Maine bait dealers to talk about their storage capability, which she said was limited, and herring alternatives such as pogeys and redfish, whose prices likely will rise as lobstermen are forced to abandon herring as bait. Pat Keliher, the commissioner of Maine Department of Marine Resources, failed to persuade the council Tuesday to reduce the amount of herring it will leave in the sea to feed other fish – the council settled on 20 percent – and to keep more of the small quota that it wants to set for 2019 for those who fish in the area near shore in the Gulf of Maine. That nearshore herring fishery in the Gulf of Maine is not only populated by local purse seiners in the summer and trawlers that dock in Portland over the winter, early spring and fall, but having that local source of herring helps to keep the cost of bait down – transportation costs are low when it doesn’t have to be trucked as far – and availability in peak lobster season high, Keliher said. In a statement released through a spokesman after the meeting wrapped up, Keliher also voiced concern for Maine’s herring fleet. The council opted to push midwater herring trawlers, which drag nets from their stern or between pairs of trawlers working together to catch whole schools of herring, at least 12 miles away from shore. Regulators estimate that ban will cost the midwater herring trawlers that fish near Maine shores about $2.5 million a year, as that is where they make about 75 percent of their money. Environmental groups, purse seine herring fishermen and fishermen who make a living off fish that eat herring say that these midwater trawlers have wrecked the fishery, sucking the local waters dry of herring and prompting the fish, birds and mammals that rely on them to leave. Some accuse the trawlers of wrecking herring spawning grounds, contributing to the low juvenile numbers. But trawlers say the scientists who conducted the stock assessment note that overfishing isn’t what caused the declining numbers, not even of juvenile herring. When pushed, scientists told the council they aren’t quite sure what caused the decline in juveniles, but argue the council can’t wait around to act while further studies are conducted. In 2017, the Atlantic herring population dropped to 239,000 metric tons, according to the stock assessment finalized Tuesday. Of those, just 3.9 million were juveniles, which is the second lowest number ever recorded. Four of the lowest estimates for juvenile herring have been recorded in the last five years, the assessment shows. In comparison, about 50 years ago, when the herring population was at its peak, there were more than a billion juvenile Atlantic herring. That prompted regulators to cut the herring quota in the middle of the 2018 season from 110,000 to about 50,000 metric tons. It sounds like a lot, but that is about what herring fishermen landed last year. The lobster industry was already worried about what that cut would do to bait availability in the future, but regulators gave them more to worry about on Tuesday when they voted to ask federal regulators to adjust next year’s quota to 14,558 metric tons – a figure that most herring and lobster fishermen in the crowd said would leave almost no herring fishery at all. And most of that quota would be given to offshore fishermen, including many trawlers that were forced out of near-shore waters by that trawling ban enacted earlier, who fish in waters off Georges Bank that have not yielded much herring in recent years. A motion to grant more of that greatly reduced quota to near-shore purse seiners near the Maine coast failed. Regulators who supported giving more of the quota to Georges Bank fishermen said it would help alleviate the sting of that trawler ban, help mackerel fishermen trying to make a comeback avoid getting shut down by bycatch restrictions, and offer some extra protection to inshore spawning grounds and Massachusetts fishermen who earn a living off the predators who eat herring.